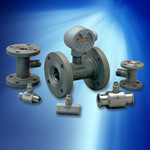 Hile Controls of Alabama represents Flow Technology Inc., a manufacturer of turbine, magnetic, ultrasonic, and positive displacement flow meters utilized in process measurement and control. The company also manufactures flow meter calibration equipment, and they have summarized some useful information regarding turbine flow meters into a concise white paper, which is included below. The paper provides a description of how a turbine flow meter operates, and continues with a short narrative of turbine flow meter advantages for certain applications. Calibration procedures are also outlined, with a combination of technical and non-technical language that provides useful information and understanding to the expert and not so expert reader. Concepts are illustrated to provide additional clarity. Browse the paper. The text portion is just a few pages. Share your flow measurement challenges with a product specialist and combine your process experience with their product expertise. That is where the best solutions come from. Selection and Calibration of a Turbine Flow Meter from Hile Controls of Alabama, Inc.